Lilium amabile Palibin (2n = 2x = 24) is an endemic lily species in Korea. B chromosomes are supernumerary chromosomes and the presence of B chromosome in L. amabile was known by previous researches. The current research was conducted to characterize the genetical and cytological features of the B chromosome plants in L. amabile. 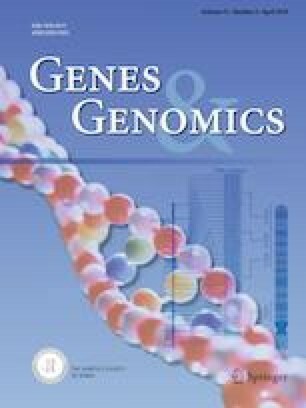 Karyotype and B chromosome cytotype analyses were carried out among 135 L. amabile accessions that were collected from six geographical locations in Korea using conventional aceto-carmine staining as well as FISH technique with ribosomal RNA gene probes. The karyotype of L. amabile genome consisted of two large metacentric, four intermediate subtelocentric, and six intermediate to small acrocentric chromosomes in which chromosomes 1, 6 and 7 carried the 45S rRNA gene loci and chromosome 3 carried the 5S rRNA gene. There were 4 types of B chromosomes, two large B chromosomes and two small B chromosomes. The ribosomal RNA gene loci were not present in the B chromosomes. The 135 accessions were classified into 13 cytotypes including diploids and different B chromosome aneuploids. Among the aneuploids, the most frequent cytotype was 24 + 1B, which was followed by 24 + 2B, 24 + 1b, 24 + 1B + 2b, 24 + 1B + 4b, and 24 + 2B + 4b. The karyotype of L. amabile was consistent with other species in the genus Lilium without polyploids. The B chromosome cytotypes were highly variable and the occurrences of different cytotypes were random among the six populations, implying that the B and b chromosome occurrence was random in each population. We appreciate to Dr. George Fedak for critical reading and suggestions on the manuscript. This work was carried out a grant of a Golden Seed Project, the Ministry of Agriculture, Food and Rural Affairs, Republic of Korea (Project No. 213007-05-1-SBN10), a grant from the Germplasm Reservation Center Program, Rural Development Administration, Republic of Korea (project PJ010372) to JHK, and a grant from National Research Foundation of Korea to NSK (Project No. C1013144-01-01).